The Purple Agency: Social media – to post or not to post? 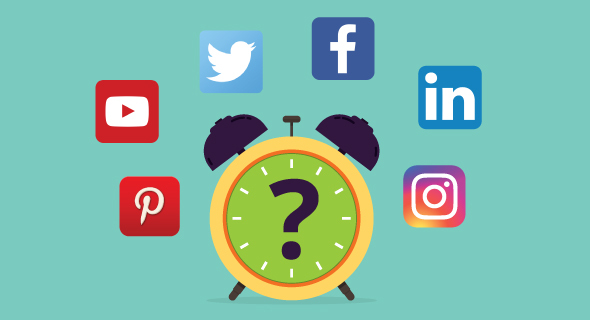 It’s a question that has been baffling marketers since the beginning of social media marketing – when and how often should you post on social media? There have been plenty of studies to answer the question, from social media giant Hootsuite, to articles from leading marketers on Forbes. The short answer of course is; when your audiences are most likely to be listening! Based on the studies above, the consensus seems to be that the optimal time and frequency to Tweet is about 3 - 5 times a day at around 3pm and post on Facebook once a day between 12pm and 3pm. Every brand’s audience is different and the acid test is when you get most engagement. Social media is a great communication channel for brands that creates a more personal relationship, leading to improved customer loyalty, increased inbound traffic and higher conversion rates. It’s also true that social media marketers who have an instinctive understanding of how their audience interacts will have the most success with social. So, if you’ve got a regular supply of high quality, owned and third party content to share, and a content strategy, social media can be a real boost to your marketing efforts. But let’s forget the studies for a moment and go back to basics – what is social media? At its simplest level it is a collaborative digital space where the online community can interact publicly, sharing thoughts, ideas, images and views. It’s about being “social” with communities and those who share similar interests to us. By its very nature it’s reactive and conversational, so should we really be trying to programme when and how often we post? It seems to me that we should follow one simple rule - only post when you have something to say that’s valuable, relevant and interesting to your community. With so much content available, and so many channels through which to find it, the tweeters and Facebook users of today expect to be informed and entertained. They no longer tolerate mediocre content, so if you don’t think your followers will like it – don’t post it! People follow brands on social media because it benefits them in some way, because the content entertains them, they learn something new, or maybe get access to a promotion, product info or instant customer service. As soon as that content becomes too frequent, dull or worse, useless, many won’t hesitate to press that unfollow button. A recent survey by Sprout Social of more than 1000 people found that 41.1% would unfollow a brand if the information wasn’t relevant. People expect high quality content when they follow a brand so it’s absolutely vital to understand what content resonates with your audience. Social media platforms are constantly evolving to improve the user experience and prevent spam-filled newsfeeds. In order to do that, they need to make sure people only see the content they’re likely to care about, and most social platforms have already taken measures to prioritise popular content. Therefore, the social posts that don’t attract adequate interaction are the least likely to be seen. This means that the social media landscape has become a battle ground for brands, with everyone competing for likes and retweets. To cut through the noise you need stand-out content otherwise your posts will sink to the bottom of the pile and, with a half-life of a tweet only 24 minutes, this could happen faster than you think! It’s easy to get wrapped up in social media. Mainly because it appears to give you the opportunity to directly connect with your target audience and provides loads of data on their characteristics and habits, data that can potentially help you understand your customers and improve how you market to them. …only post when you have something worth saying, something that that’s valuable, relevant and genuinely interesting to your audience!